I went into Little Fires Everywhere blind. I had read no reviews. I had seen no summaries. I knew it was highly regarded: book of the year according to several sources, NY Times bestseller. Nothing, though, could have prepared me for just how good this story is. The Richardsons are a model suburban family living in an idyllic community, Shaker Heights, OH, an actual suburb of Cleveland. They have four children who are active in high school sports, drama, and music. And as the book opens, they are coming to grips with the fact that their house is burning down, and the likely arsonist is youngest daughter, Izzy. Mia Warren and her daughter, Pearl, rent their house from the Richardsons. Mia is an artist, selling enough just to get by with help from part-time jobs, but not likely to become famous. She and Pearl have lived all over the country, moving as Mia’s artistic muse calls. Pearl is a student in high school with the Richardson children, and they are hoping to stay put for a few years so Pearl can have a normal high school life. It’s easy enough to summarize the main plot threads. The families become more and more interconnected, as all of the Richardsons are drawn to one or both of the Warrens. Moody and Pearl become best friends. Trip and Pearl start sleeping together. Mrs. Richardson hires Mia to do some housekeeping. Lexie befriends Pearl and calls on her during a time of personal crisis. Izzy finds in Mia the love and support she cannot get from her own mother. As these ties grow stronger, Mrs. Richardson’s lifelong friend tries to adopt a Chinese-American baby who had been abandoned at a fire station. The baby’s birth mother wants to get her back. And this drama, played out in the courts, drives a wedge through the relationships. There’s more. So much more. But frankly, any summary of the plot leaves so much out that it is unfair to the book and to the author. 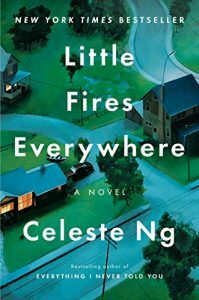 Celeste Ng has written a story about motherhood, about adolescence, about decisions that you carry with you for your entire life, and has written it beautifully and memorably. Her descriptions of Shaker Heights make it part of the book, another character that plays its own role in the drama. Ng grew up in the real Shaker Heights, OH, and you can tell from the details in this book that it was both a wonderful place to live and a wonderful place to leave. The mothers in the book are all very, very different. Elena Richardson plays by the rules. She grew up in Shaker Heights. She has some liberal views on things, but cannot abide by chaos or entropy. So when her friend runs into trouble with her adoption, that is unfair. Her friend played by the rules. Mia Warren makes up her own rules. Itinerant for most of her adult life, she raised her daughter as a free spirit. When her friend, Bebe Chow, pulls her life together and wants to reclaim the baby she gave up in a moment of desperation, Mia helps. Pearl is drawn to the stability and predictability of the Richardson household, and sees aspects in Elena that she has never seen in her own mother. Izzy is drawn to the freedom and acceptance of Mia, so different from the judgment she feels by being a less-than-perfect Richardson. Little Fires Everywhere describes the destruction of the Richardson’s home. Gasoline poured on each bed, lit, came together in a conflagration. It also describes the process of starting over from scratch. No one thing destroys a relationship or leads to a life-altering change. It is a bunch of small things, seemingly insignificant on their own, that add up to a prairie fire. Celeste Ng. has written a fantastic book that shows these fires being set in the lives of two suburban families. Like most fires, this one is dangerous and beautiful to watch.